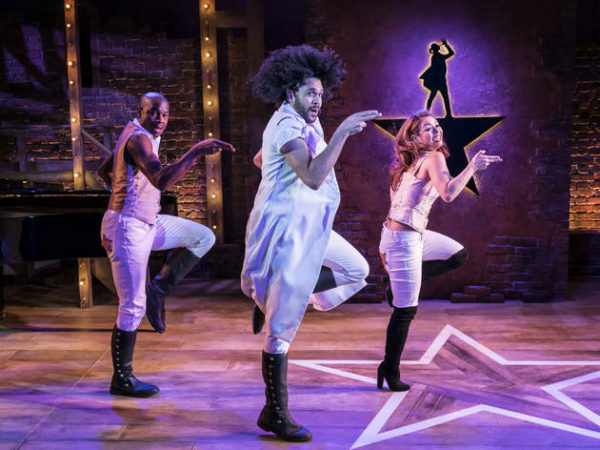 ‘Raise a glass to theatre’: Ed Nightingale reviews the spoof version of Hamilton. Spamilton at the Mernier Chocolate Factory. Photo: Johan Persson. For all its Broadway ubiquity and numerous awards on both sides of the Atlantic, it’s sobering to see that Hamilton isn’t invulnerable. As much as Spamilton is a celebration of what makes Lin Manuel Miranda’s opus such a hit, it’s also not afraid to poke fun at its flaws. That’s what makes this parody so enjoyable: it’s lovingly irreverent, but there’s some truth to its biting humour. From the creators of the revue parody Forbidden Broadway, Spamilton tells the tale of Miranda himself (played by Liam Tamne) as he strives to reignite Broadway, to come up with something new and fresh, competing with the classics and the jukebox musicals alike. He’s “not gonna let Broadway rot” and so his show becomes a sensation, but calls to “put back the tune” are not without reason. There are moments in Hamilton where the rap delivery whips by too quickly, plot points are lost, and the audience takes time to tune into the style. The same can be said here, with jokes sometimes thrown away in a flurry of rhymes. The performers are exceptional and wouldn’t be out of place in Hamilton itself. With a core cast of just five, their effort and investment at learning so much material for such a dense 80 minute show is impressive. As Miranda, Tamne captures the nuance and intonation of his delivery perfectly, and the remaining cast sing and rap with both clarity and vocal gymnastics. In addition, Damian Humbley offers a fun performance as the queen, but it’s Sophie-Louise Dann and her multiple impressions who steals the show – from the frantic mannerisms of Liza, to the snorting laugh of Elaine Paige. No matter how good the performances, though, a show of this nature is only ever as good as its script. Writer and director Gerard Alessandrini does succeed for the most part. He smartly reconfigures the structure and music to tell a very different story. Key lyrics are ingeniously twisted while also playing on Hamilton’s more melodramatic moments – the rewind in the first act, or the reveal of Eliza’s orphanage. There are even nods to Miranda’s other work, including his poaching by Disney for Moana and his previous show now called In The Hype. None of it truly has the audience guffawing, but it’s enjoyable stuff nonetheless. Morgan Large’s set design is a more compact version of the Hamilton original and costume designer Dustin Cross adds amusing touches to the traditional dress. Yet more than just Hamilton, Spamilton is an ode to theatre itself – indeed the final number asks us to “raise a glass to theatre”. There are comical nods to everything on Broadway, from Lloyd Webber, Les Miserables and Mamma Mia, to Disney musicals and even Harry Potter. It’s also an ode to Sondheim. After all, rapping is just a Sondheim “word buffet” without the melody, right? In one particular section, Miranda calls upon his aid which results in a medley of revamped tunes that’s as hilarious as it is clever. There’s also the running thread of Sweeney Todd’s beggar woman asking for tickets, and later other Broadway shows attempt to assassinate Hamilton to the tune of Everybody’s Got The Right. This is Spamilton at its finest – ironically as far removed from Hamilton as it gets and aimed squarely at theatre nerds. As a result, the more pop culture moments fall flat. There are moments where popular rappers are referenced – as if Eminem and The Fresh Prince were still considered cool – and impressions of pop divas are awkward compared to those of the Broadway greats. Alessandrini is certainly more comfortable within the realm of theatre. Spamilton wouldn’t even be possible, though, without the juggernaut success of Hamilton. And there’s surely more of that to come, with the penultimate number highlighting the inevitable prospect of “the film when it happens” and the mad rush to gather famous actors and make as much money as physically possible. “Johnny Depp as Hamilton?” Terrifying. Spamilton is on until 8 September 2018 at the Mernier Chocolate Factory. Click here for more details.